Sending you love on this day. On Valentine’s Day ’06, I came home to the most wonderful, creative, and beautifully simple gift. 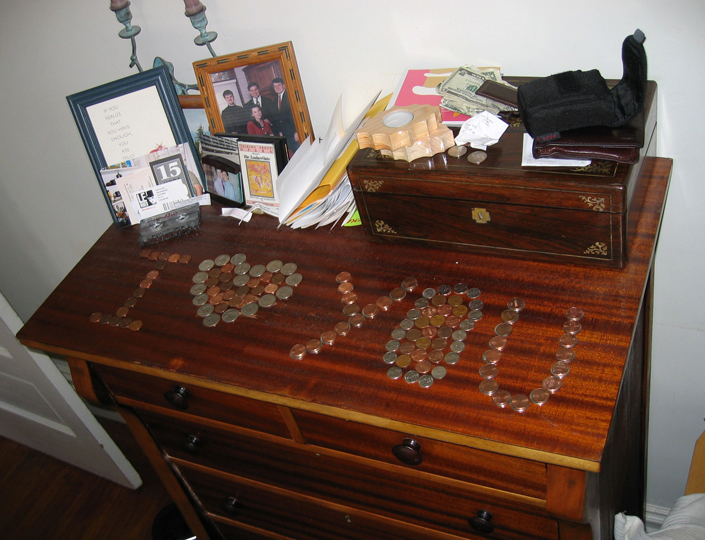 My partner had gathered up all the coins in our piggy bank (well, really, just two mugs), and fashioned a message on our dresser. It still resonates to me as the most memorable loving gesture, because it cost nothing (well, no more than $7.50 anyways), and was so truly sweet in its ingenuity. I share it with you now, to send out love to you on this day, however contrived by greeting card companies Valentine’s Day may be…or, even if you begrudgingly consider it Singles Awareness Day (S.A.D.). I wondered, is this too personal to share? Should I just keep it as a special memory only for us to share? Nah!…because, perhaps it’ll give you your own ideas of how to use loose change to craft a special message or artistic idea, OR inspire you to come up with other inexpensive/free gestures of love…which are really the best and most memorable in my book!